Join art historian Nancy DeLucia Real in a celebration of Easter and Spring at the J. Paul Getty Museum (Getty Center). 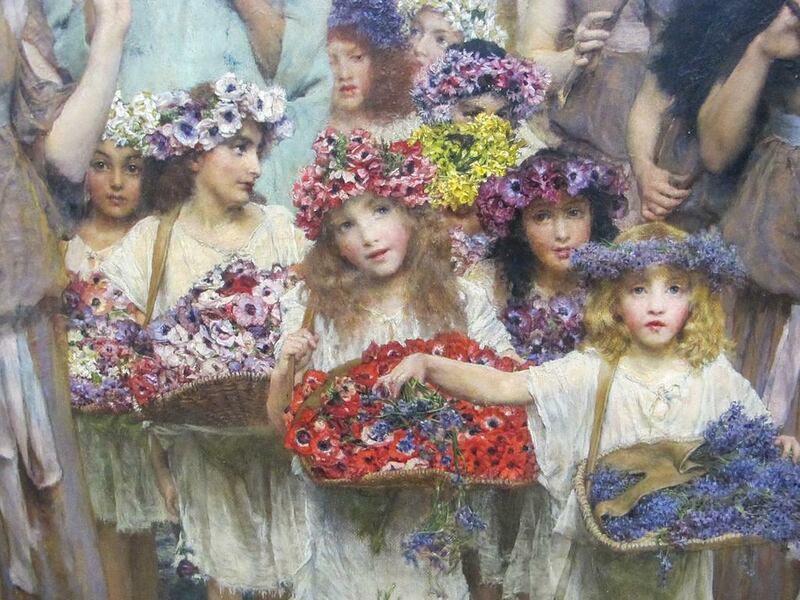 While strolling along the museum’s permanent collection galleries, Nancy will focus on the representation of Easter and Spring from Renaissance to Impressionist art. Participants will explore the vibrant and colorful mingling of holiday and season in paintings, drawings, sculpture and decorative arts. A hands-on cooking class and festive meal with wine will follow at a nearby kitchen. Note: Course fee is nonrefundable. Parking Fee: Getty Center Parking Cost of $15.00 is not included. Carpool is encouraged. To reserve your space, email Nancy DeLucia Real at: thekitchenbuzzz@gmail.com or call 310.962.4043. NOTE: THIS COURSE IS SOLDOUT! Note: course fee does not include the Getty Museum parking fee of $15.00 per vehicle. Carpool is suggested. Discover how French artists used their palettes to create tour de force paintings! 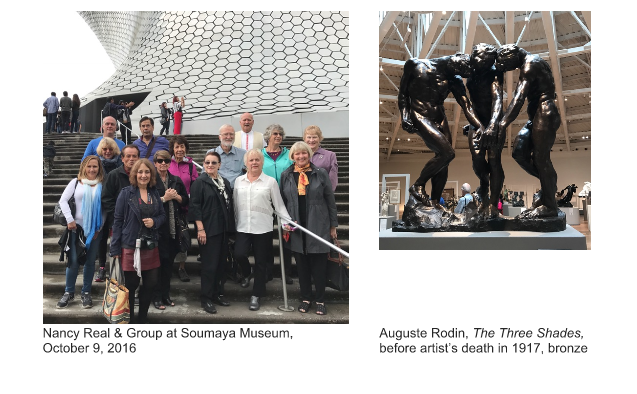 Join art & culinary historian Nancy DeLucia Real in this culinary course with a focus on French artists, culture and cuisine. Strolling alongside Nancy in the J. Paul Getty Museum’s galleries, you will view 18th through 20th century masterpieces (including the Impressionists’ landscape, portrait and still life paintings). Finally, you will participate in a hands-on cooking class and feast on foods & wine that delighted the French artist’s palate! To register for this course, please contact Nancy DeLucia Real by email: thekitchenbuzzz@gmail.com or telephone 310.962.4043. This course fee is nonrefundable. If Nancy cancels the course (for emergency only), the course fee will be refunded by 100%. NOTE: This exclusive culinary course is limited to 12 participants. 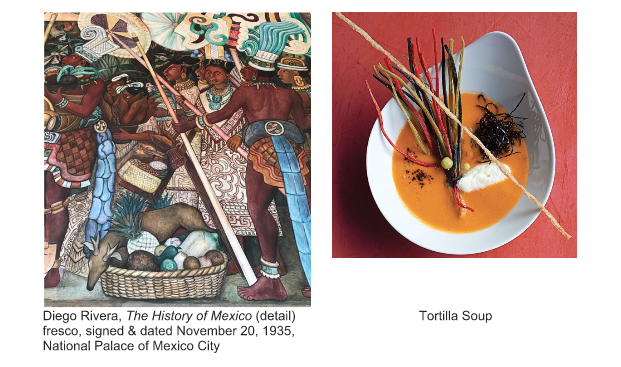 Join art & culinary historian Nancy DeLucia Real (member of the California Culinary Historians & founder of The Kitchen Buzzz) in an historic culinary course. The day begins with a tour of Rembrandt and the Inspiration of India (on view March 13-June 24, 2018) at The Getty Center. 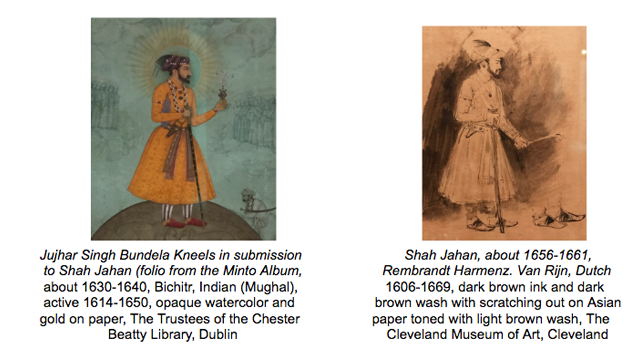 You will view Rembrandt’s refined drawings of emperors and courtiers of Mughal India alongside vibrant paintings of the Indian artists who inspired him. From art to gastronomy, you will explore the global trade and cross-cultural exchanges between Europe and Asia during the time of Rembrandt. A hands-on cooking class follows (at a private home) – you will create and enjoy an exotic Dutch-Indian feast! See exhibition details here: http://www.getty.edu/art/exhibitions/rembrandt_india/. 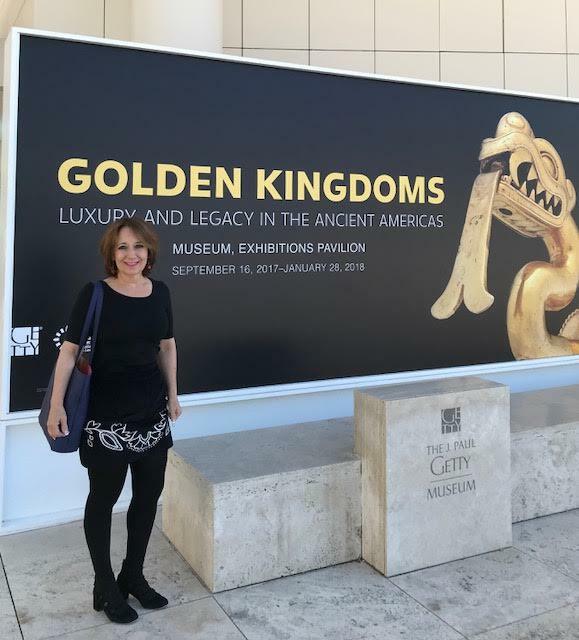 Time: 3:30 p.m. to 4:45 p.m.
Join art historian Nancy DeLucia Real on an exclusive, interactive tour of Golden Kingdoms (Art and Legacy in the Ancient Americas). Focusing on the luxury arts of pre-Columbian America (Mexico, Costa Rica, Columbia, Panama and Peru), you will be astounded by the brilliance of feather works, fine textiles, shell, gold, turquoise and more. From 1,000 BCE to the arrival of Europeans in the 16th century, precious materials were linked to status, rituals and ceremonies by the Moche, Incas, Mayas, Aztecs and other cultures of the Americas. You will discover the cultural, social and political conditions under which these exquisite objects were made! Note: Tour fee is nonrefundable. For Parking: Getty Center Parking Cost of $15.00 is not included. Carpool is encouraged. at thekitchenbuzzz@gmail.com or call (310) 962-4043. *Note: If you request a private tour date, a minimum of 5 tour participants is required. Are you curious about how people of antiquity set new trends and/or were inspired by others? In this culinary workshop, art and culinary historian Nancy DeLucia Real will link the innovations and influences shared among the Etruscans, Greeks and Romans. You will discover the culture and cuisine of these three civilizations by touring the Getty Villa galleries. 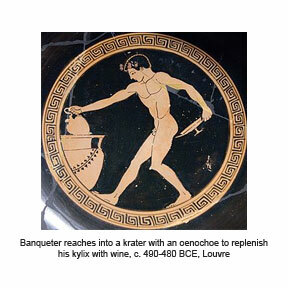 Course participants will prepare and enjoy a class banquet with wine – just as the Ancients did! To register for this workshop on May 23, go here- http://www.getty.edu/visit/cal/events/ev_1756.html -or- telephone the J. Paul Getty museum at 310.440.7300. Note: This tour is limited to 14 participants. Teotihuacan Pyramids – We will visit the pyramids in the holy city of Teotihuacan (‘the place where the gods were created’), located North East of Mexico City & built between the 1st and 7th centuries A.D.
Free Evenings – an opportunity for you to discover new restaurants, cafes and entertainment highly suggested by Nancy Real. Tips to porters, bellboys and maids at hotels and waiters for all included meals; -Hotel and VAT taxes. 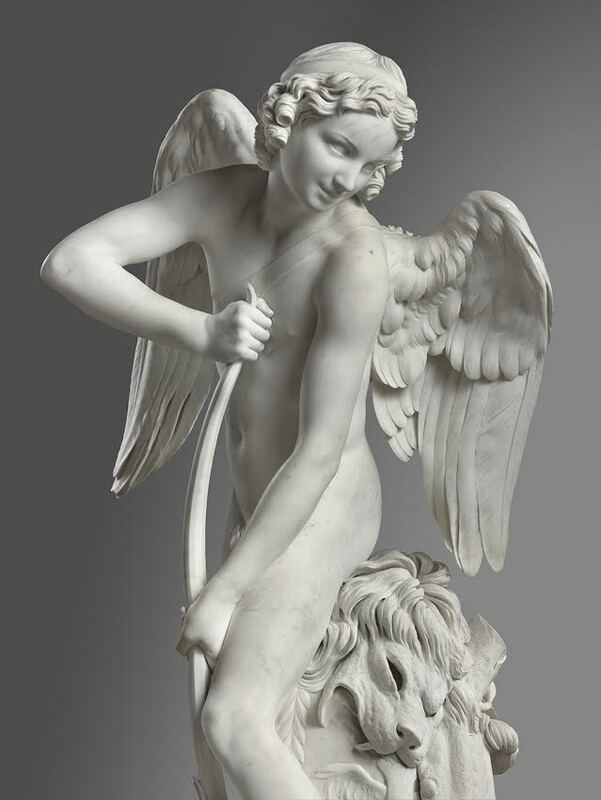 On this tour, you will meet Edmé Bouchardon (1698-1762), an artist who possessed the extraordinary, creative impulse that would win him the title, royal sculptor and draftsman to King Louis XV of France. Art historian Nancy DeLucia Real will introduce you to great masterpieces in Bouchardon – Royal Artist of the Enlightenment (on view through April 2, 2017). While viewing portrait busts of VIP’s, religious and mythological sculpture, graphic arts and designs for Louis XV’s equestrian monument, you will discover what inspired Bouchardon to create his unique masterpieces. Join art historian Nancy DeLucia Real for winter holiday tour of the J. Paul Getty Museum’s permanent and special exhibitions. As a starting point, you will tour The Shimmer of Gold: Giovanni di Paolo in Renaissance Siena, (on view through January 8, 2017). Strolling along the galleries with Nancy, you will be astounded by the museum’s permanent collection featuring illuminated manuscripts, paintings, decorative arts and sculpture. *Note: If requesting a date for a private tour, a minimum of 5 tour participants is required. Led by educator and chef Nancy DeLucia Real, this culinary workshop brings you back in time to the medieval world. 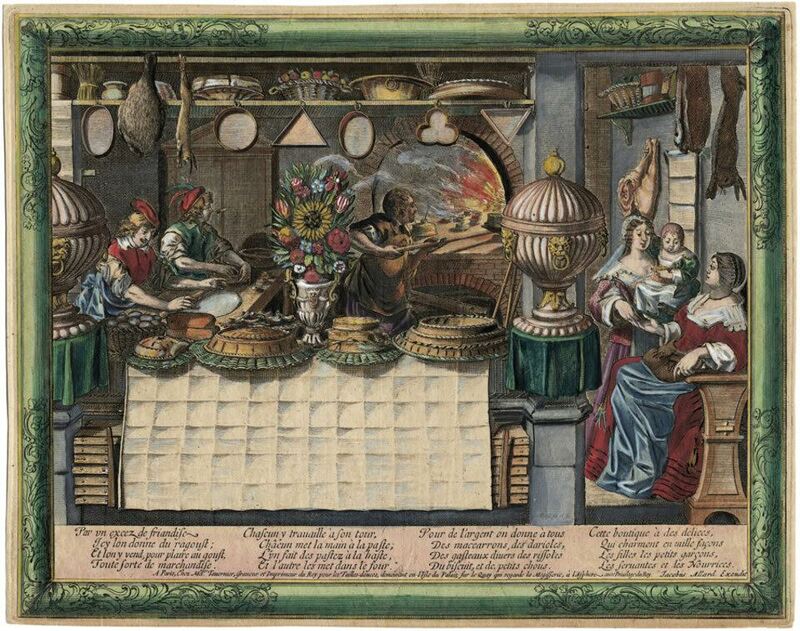 Participants visit The Alchemy of Color in Medieval Manuscripts and The Art of Alchemy exhibitions, explore connections between food, color, science and alchemy, then prepare a class feast for the eyes, body and spirit. To register for this course, on November 1, 2016, go here: http://www.getty.edu/visit/cal/events/ev_1360.html -or- telephone the J. Paul Getty Museum at 310.440.7300. Note: There are 2 spaces left on this trip (see below). – Nancy DeLucia Real will lead thIs tour in Mexico City. – Transfers from Mexico City International Airport to hotel and from hotel to airport (upon departure from Mexico City). – Tips to porters, bellboys and maids at hotels and waiters for all included meals; -Hotel and VAT taxes. For the 2 spaces remaining: 1 room (2 adults per room). 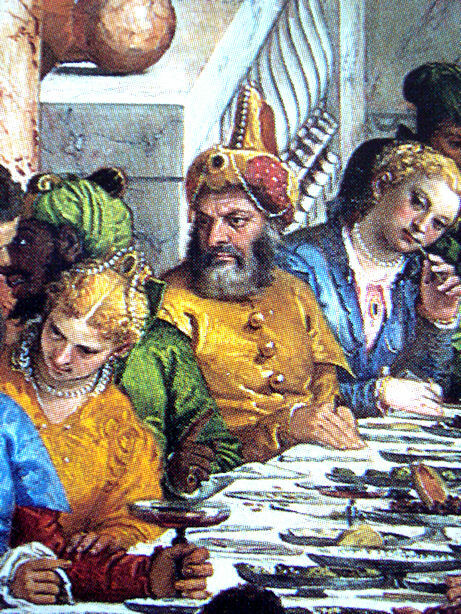 Want to know what types of foods were served throughout Rome’s territories? Join educator and chef Nancy DeLucia Real for a culinary exploration of the ancient Roman provinces. You will tour the exhibition Roman Mosaics Across the Empire, and then prepare a class banquet inspired by historic ingredients from ancient Syria, Tunisia (Carthage), France (Gaul) and Rome. 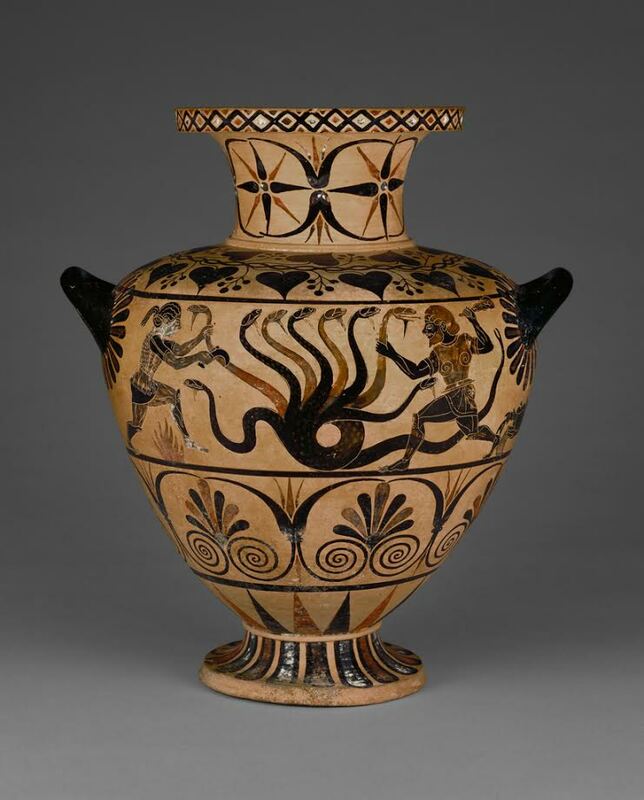 To register for this course, on April 11, 2016, go here http://www.getty.edu/visit/cal/events/ev_1018.html -or- telephone the J. Paul Getty Museum at 310.440.7300. Bon Appetit, Your Royal Highness! Join art historian & chef Nancy DeLucia Real in this culinary course focusing on French historic cuisine. 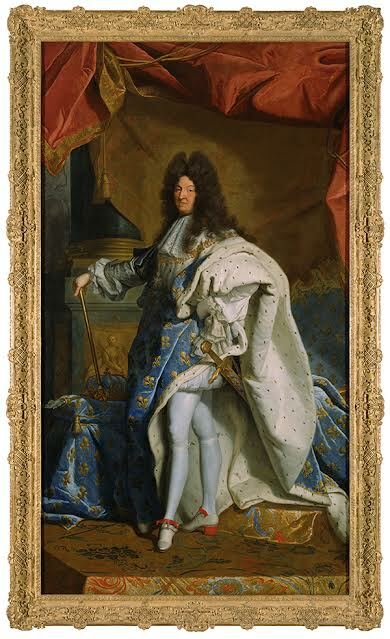 While viewing the exhibition, Woven Gold: The Tapestries of Louis XIV (on view until May 1, 2016), you will virtually walk alongside the king at Versailles and other palaces. 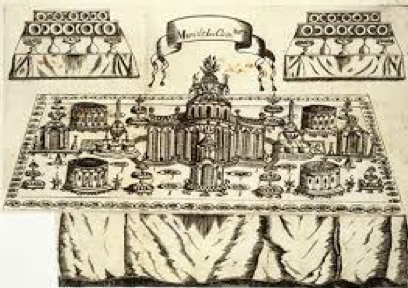 You will discover the banquets and magnificent foods enjoyed by French nobility in the 17th century. A hands-on cooking class will take place at a venue close to the Getty Center, followed by a repas royal or royal meal with wine. To register for this course, email: thekitchenbuzzz@gmail.com or call Nancy Real at 310.962.4043. Course Fee: $84.00 (members); $89.00 (nonmembers). 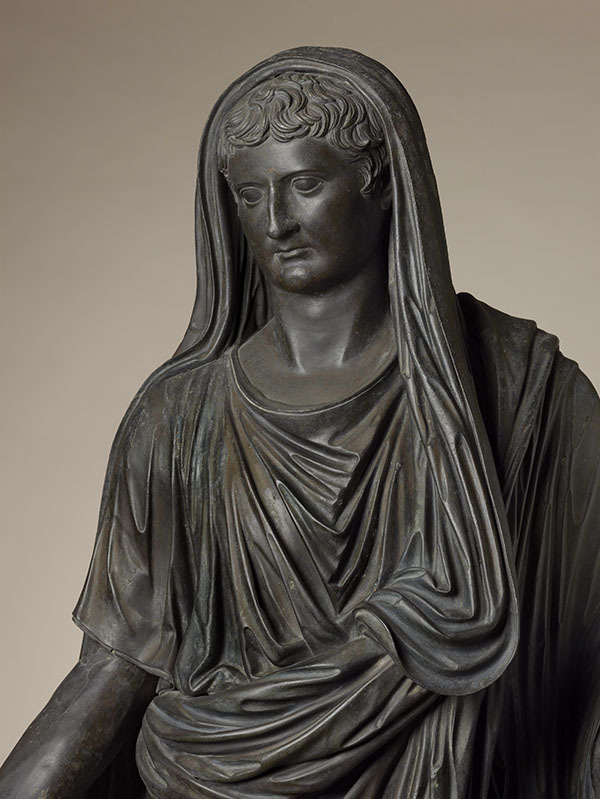 Join art historian and chef Nancy DeLucia Real on a tour of the exhibition, Power and Pathos: Bronze Sculpture of the Hellenistic World (on view July 28-November 1, 2015). 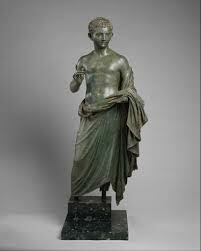 You will view bronze sculptures of the Hellenistic period (dating from the death of Alexander the Great in 323 B.C. to the foundation of the Roman Empire in A.D. 31). Interactive discussion will ensue regarding how Roman aristocrats collected, copied and proudly showcased these masterpieces at their villas. Then, at the Italian Cultural Institute, you will prepare and enjoy foods from an ancient convivium or banquet – and chat about a Roman host’s collection of bronzes! This exciting art and culinary course begins with a virtual visit to a sixteenth-century artist’s studio. 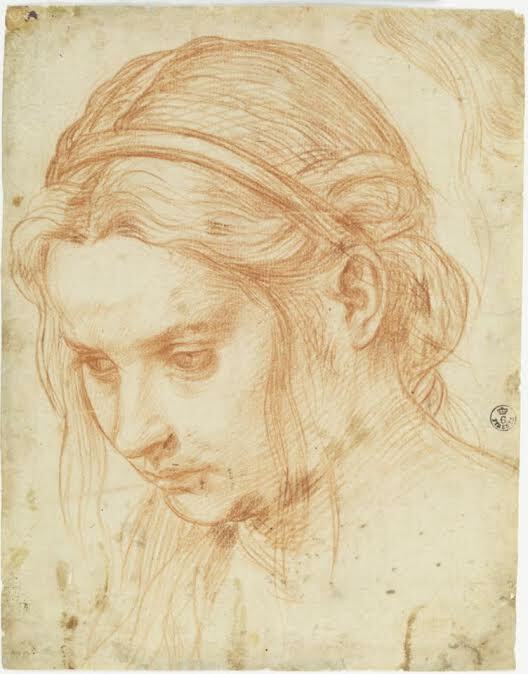 Join art historian and chef Nancy DeLucia Real for a tour of the exhibition, Andrea del Sarto: A Renaissance Workshop in Action (on view June 23-September 12, 2015 at The Getty Center). 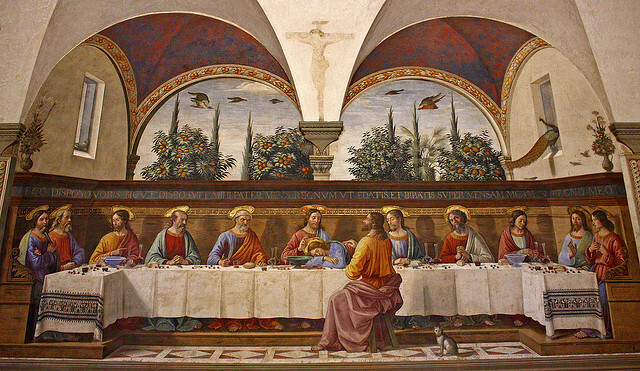 The course continues at the Italian Cultural Institute where participants will prepare and enjoy a Renaissance feast. Buon appetito! 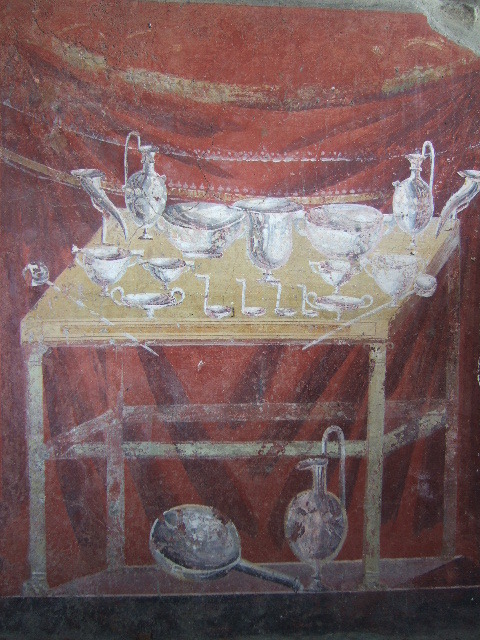 before AD 79, in the tomb of Gaius Vestorius Priscus, at Pompeii. NOTE: Due to high demand, this course is being repeated. It previously sold out on December 4 & 5, 2014. Join museum educator and chef Nancy DeLucia Real to explore the art, culture and religion of Roman Gaul (modern-day France) in a hands-on historical cooking class. Participants view lavish silver artifacts in the exhibition Ancient Luxury and the Roman Silver Treasure from Berthouville, visit the Herb Garden, then prepare recipes inspired by Gallo-Romanic cuisine and ancient opulence. Tickets available beginning July 1.
http://www.getty.edu/visit/cal/days/12042014.html or call the J. Paul Getty Museum at: (310) 440-7300. 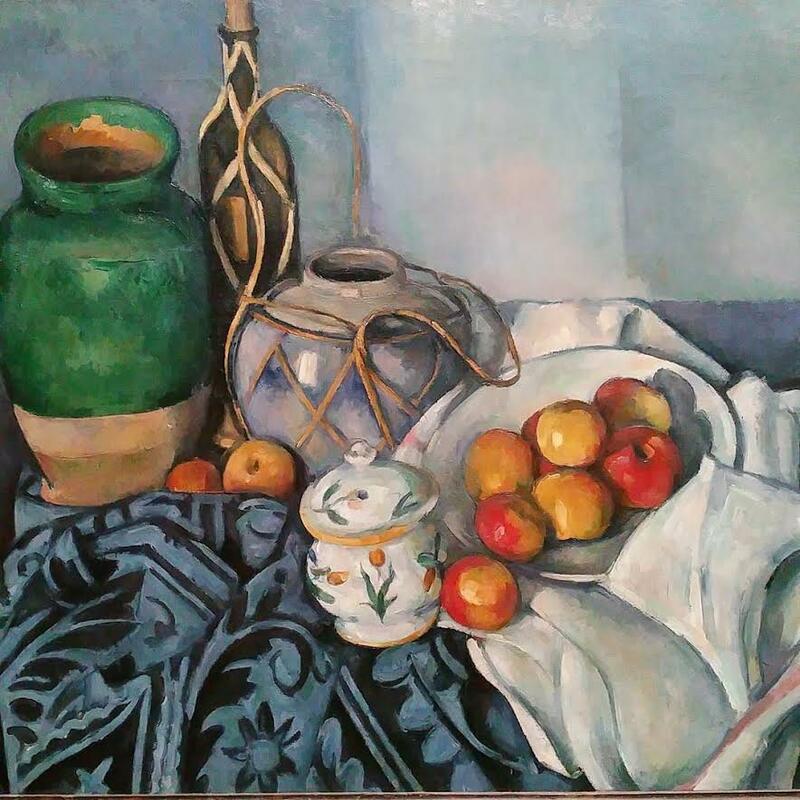 Explore the majesty of Renaissance art, culture, and cuisine from the courts of Northern Italy with museum educator and chef Nancy DeLucia Real in this hands-on culinary workshop. Participants tour the exhibition Renaissance Splendors of the Northern Italian Courts, discover period dining practices, and prepare a meal highlighting historic recipes and ingredients. Course fee $85.00. Complimentary parking. Tickets are available beginning April 8, 2015. This vibrant art & culinary course begins at the Getty Center with museum educator & chef instructor Nancy DeLucia Real. 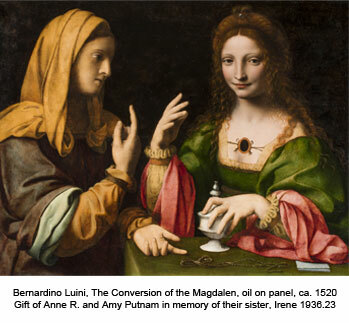 On a one-hour tour, course participants will view and discuss the Easter story in Italian painting & sculpture from the Medieval, Renaissance and Baroque periods. The Easter tradition continues at the Italian Cultural Institute where a hands-on cooking class and festive meal will follow. *Getty parking cost of $15.00 per vehicle is not included. Note: $15.00 parking fee (per vehicle) at Getty Center is not included. This culinary course focuses on the culture of 17th and 18th-century Europe in general, and Italy, in particular – the Baroque period. Museum educator and chef Nancy DeLucia Real begins with a tour at the J. Paul Getty Museum. Explore masterpieces made by Italian painters and sculptors and the artists whom they inspired. A visit to exhibitions, Drawing in the Age of Rubens and Spectacular Rubens: The Triumph of the Eucharist (on view October 14, 2014 to January 11, 2015) is included. A hands-on cooking class will follow at the Italian Cultural Institute where participants will prepare and enjoy a feast from the Baroque period (wine is included). To register, visit the: Italian Cultural Institute of Los Angeles or call (310) 824-7408. Time: 10:30 to 2:30 p.m. Known as “natura morta” in Italian, “still life” is featured in the J. Paul Getty Museum’s paintings and sculpture collections. 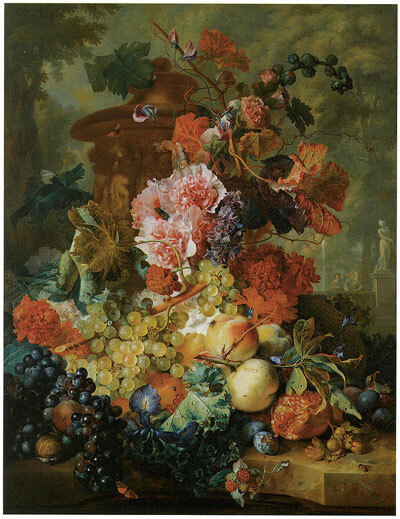 Museum educator and chef Nancy DeLucia Real leads this course, beginning with an art tour featuring vividly-rendered vegetables and fruit in Italian, French and Dutch masterpieces. Explore how this art style linked artists and patrons from Italy, France, the Netherlands and beyond. A hands-on, cooking class featuring fresh, seasonal produce and pasta immediately follows at the Italian Cultural Institute. Class participants will enjoy a vegetarian feast with wine. Time:10:00 a.m. to 2:30 p.m.
Place: Start with a one-hour visit to Santa Monica Farmers’ Market at Arizona Avenue & Third Street. Cooking class follows at a Los Angeles Kitchen close to Santa Monica. This class is limited to 8 participants. Parking charges* are not included in class fee. *Park at City of Santa Monica Public Parking Structures One or Three on Fourth Street, located between Wilshire and Santa Monica Boulevards. The first 90 minutes of parking are free. Join Chef Nancy DeLucia Real on an exciting trip to the Santa Monica Farmers’ Market. Once there, Nancy will guide participants in choosing freshly-picked herbs, veggies and sweet, ripe fruit from local, California farms. After shaking off the earth from nature’s bounty, a hands-on cooking class will follow. Participants will then enjoy a vegan and vegetarian meal “al fresco” (a pasta dish will be featured alongside other recipes). Wine is included. A nonrefundable $45.00 deposit per session is required. Contact thekitchenbuzzz@gmail.com or call (310) 962-4043. Note: If The Kitchen Buzzz and Nancy DeLucia Real cancel the course, the $45.00 deposit paid will be refunded to each participant. 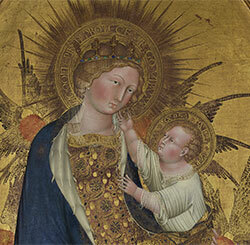 In this course, Museum Educator & Chef Instructor Nancy DeLucia Real will lead a tour of The Getty Museum’s exhibition, Miracles and Martyrs: Saints in the Middle Ages (on view September 3, 2013-March 2, 2014). 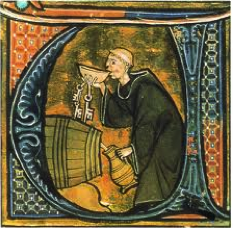 Discover art objects that will magically reveal the everyday life of nobility, peasants and clergy in the Middle Ages. The course continues at the Italian Cultural Institute where a Medieval feast will be prepared and enjoyed by course participants. Parking at the Getty Center costs $15 (not included in class fee). Visit Italian Cultural Institute of Los Angeles or call (310) 443-3250 to reserve your space. Museum Educator & Chef Instructor Nancy DeLucia Real will lead a tour of The Getty Villa’s exhibition, Tiberius: Portrait of an Emperor (on view October 16, 2013-March 3, 2014). Join Tiberius on his life’s journey while viewing a colossal bronze statue of the emperor (on loan from the Museo Nazionale of Naples). The Roman road leads to the Italian Cultural Institute where participants roll up their sleeves to prepare foods from ancient Naples, Rome and its provinces. A convivial or class meal follows. Parking at the Getty Villa costs $15 (not included in class fee). Tickets available now. Visit Italian Cultural Institute of Los Angeles or call (310) 824-7408 to reserve your space. Explore the Italian Renaissance while visiting the European galleries at the Museum with Museum Educator and Chef Nancy DeLucia Real. Join Chef Real on a virtual trip to city-states such as Florence, Siena and Milan as you learn about the intellectuals, artists and members of clergy and nobility. After touring the Museum’s galleries, enjoy a hands-on cooking class and the Renaissance feast that you will have prepared. Tickets available now. 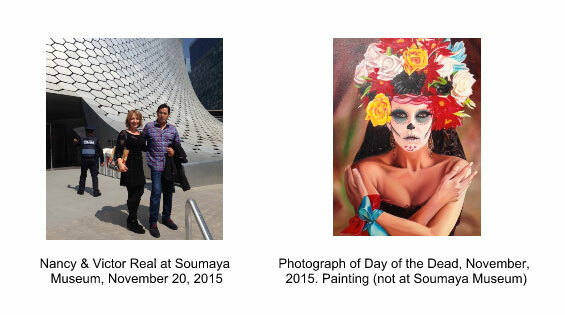 Visit The San Diego Museum of Art to reserve your space. 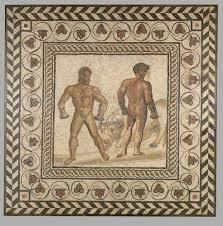 What satisfied the appetites of ancient athletes and warriors? Join chef and museum educator Nancy DeLucia Real for a tour of Greek and Roman artifacts featuring competitions, battles, and heroic celebrations. Participants prepare historic recipes and feast on a meal fit for a victor. Course fee $85 (parking included). Open to 20 participants. Visit getty.edu or call (310) 440-7300 to reserve your space. Make arrangements for Nunzia (Italian for “Nancy”) to personally lead this class at your next event! 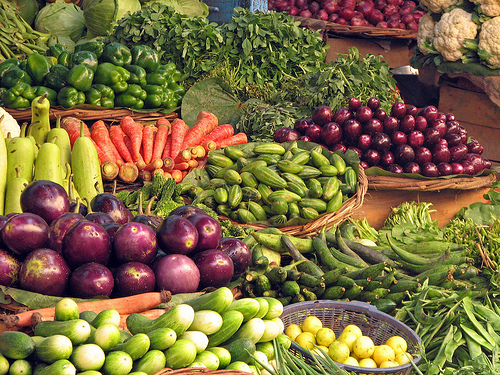 Avoid chemicals used in canned or frozen vegetables & fruits. Enjoy natural, healthy garden vegetables and fruit all year. This exciting class takes California’s ripe bounty (from farmers’ markets) & preserves its sweet, fine flavors for up to one year. 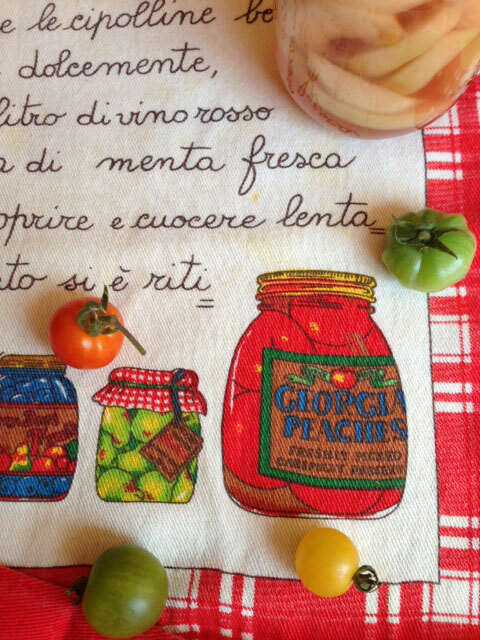 Learn how to can (in glass jars) vegetables such as ratatouille, tomatoes and fruit preserves with Chef Nunzia. Participants will employ traditional canning techniques used in Italy. This class includes a panini lunch al fresco, along with “take away” canned vegetable or fruit preserve. A nonrefundable deposit is required to reserve a class or hold a spot in a class. If a class should be cancelled by The Kitchen Buzzz, the deposit will be refunded by 100%. Arrangements can be made for private classes in your own home (location must be within a 10-mile range from Santa Monica, California – additional fees may apply). This healthy and delicious canning class is perfect for your next event/party. Class for 12 participants or more (maximum 20) – $125.00 per person. Note: Participants must be age 18 or over. telephone (310) 962-4043 or email: thekitchenbuzzz@gmail.com.